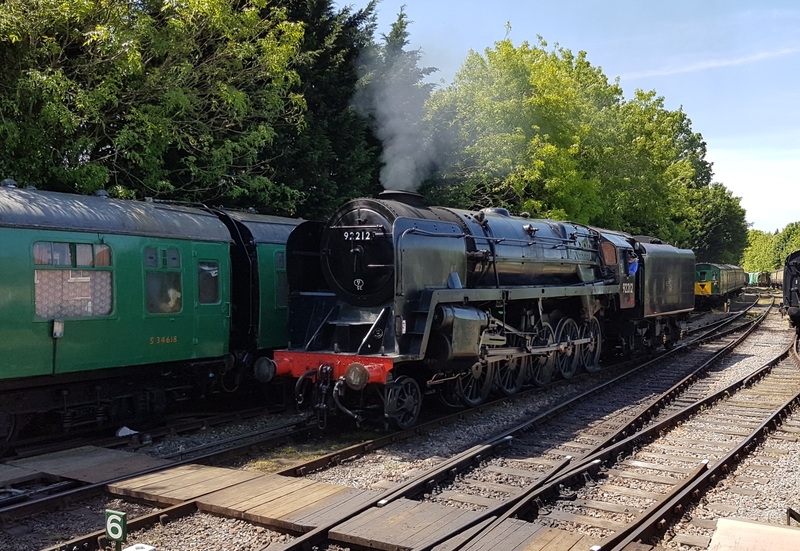 Meanwhile, back at Arlesford, 9F 92212 is running round…. 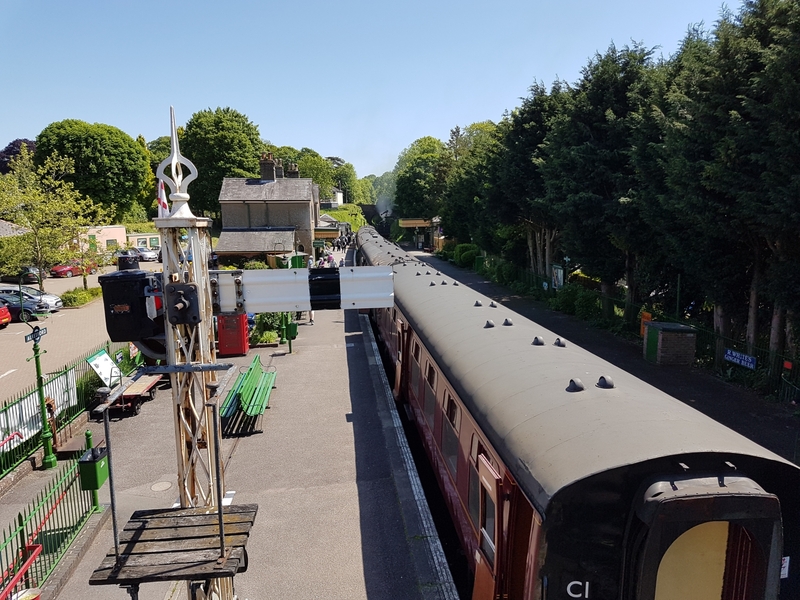 This view from the footbridge shows the details of a typical Southern lattice post signal. A pig to build in N – I once managed (most) of a rather simpler rail built post in OO. Just waiting for the signal…. Hurry up Phil, you’ll miss the 1pm to Alton…. 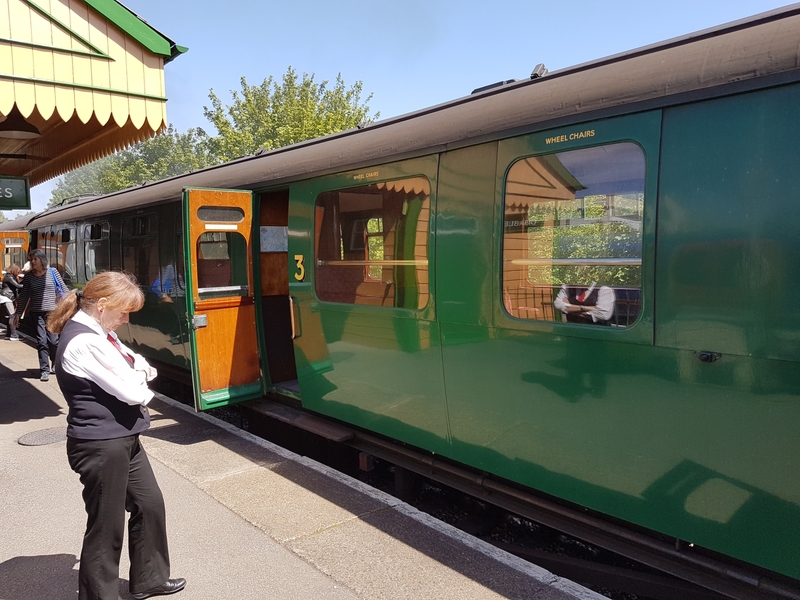 The coach behind the engine was reserved for a lunch party, so we chose the oldest coach in the train – I think it is a 1930’s Maunsell saloon. The seats were like that old sofa at home. Easy to drop into, but with tired springs and more difficult to get up! 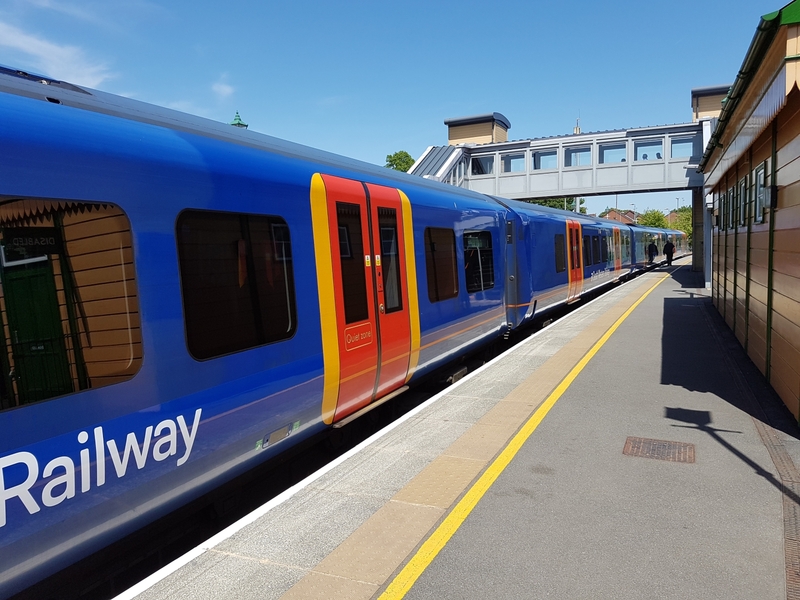 Arriving at Alton, there is an immediate contrast with the Southwest (or whatever they’re called now) EMU on the opposite platform. The footbridge in the background is the only remaining LSWR standard wooden footbridge in daily use. 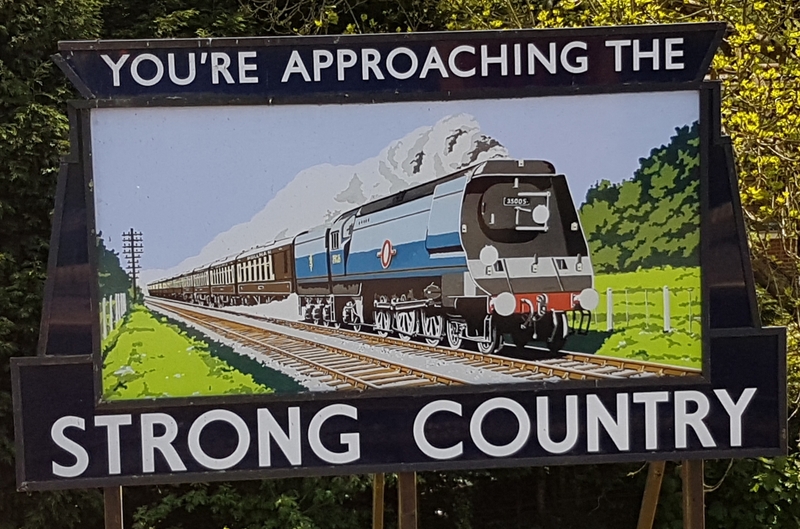 I remember these signs on the roads through Hampshire, going on holiday as a kid. All advertising Strong’s Brewery, but not with such good pictures. Running round at Alton. 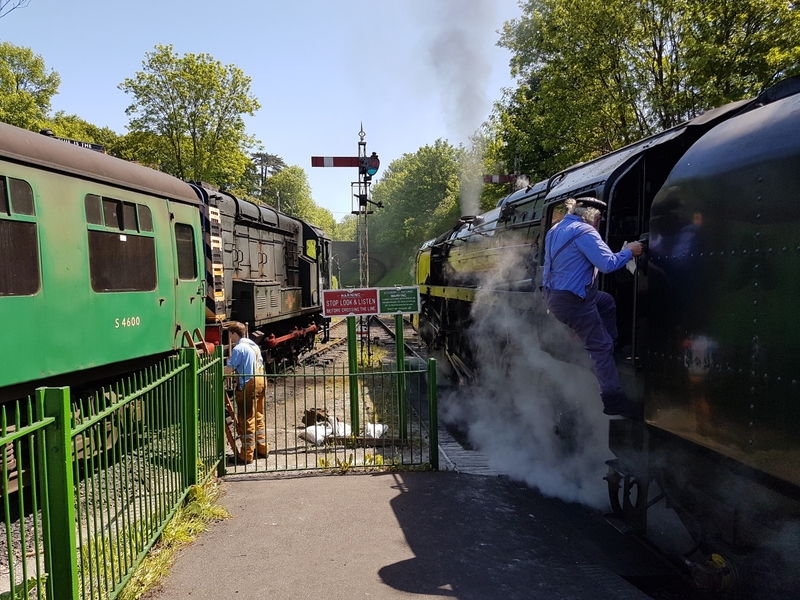 Talking to the platform staff, I found that the signal box was unmanned on quiet days such as this with one engine in steam, and with no interchange with Network Rail. The run round is automatic, the points being changed after the locomotive is detected by a track circuit. Not even the ‘big’ railways do this. Beauty and the beast? Which is which maybe depends on your era of interest! 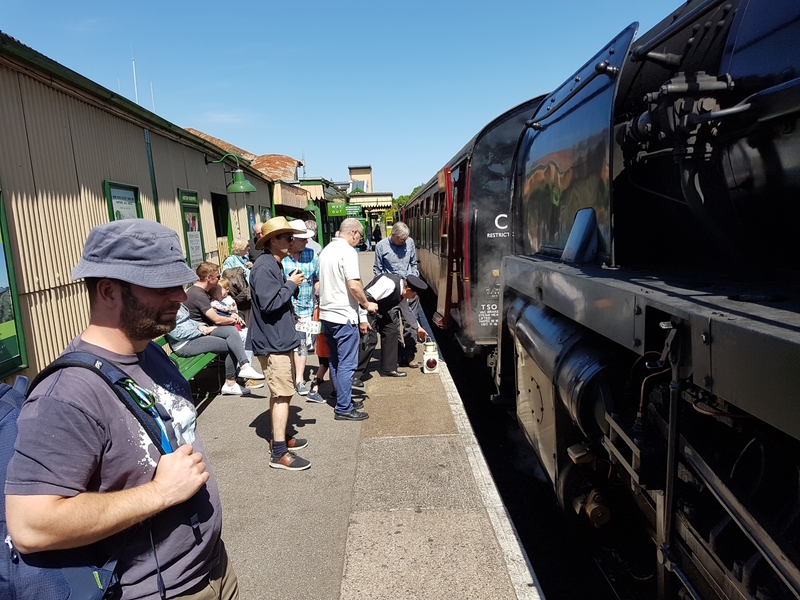 Small world department – I was greeted by a gentleman on the platform, and realised that it was Neil Grace who has traded at a number of our shows. 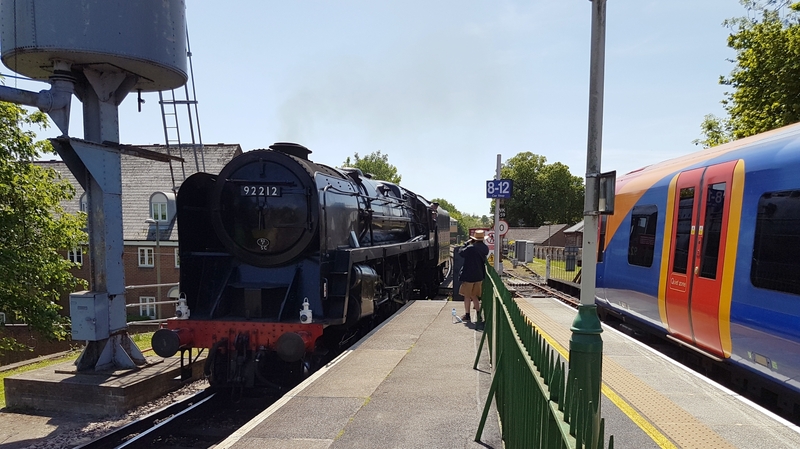 He was doing the proud grandad act – a good excuse for a day out on the railway. 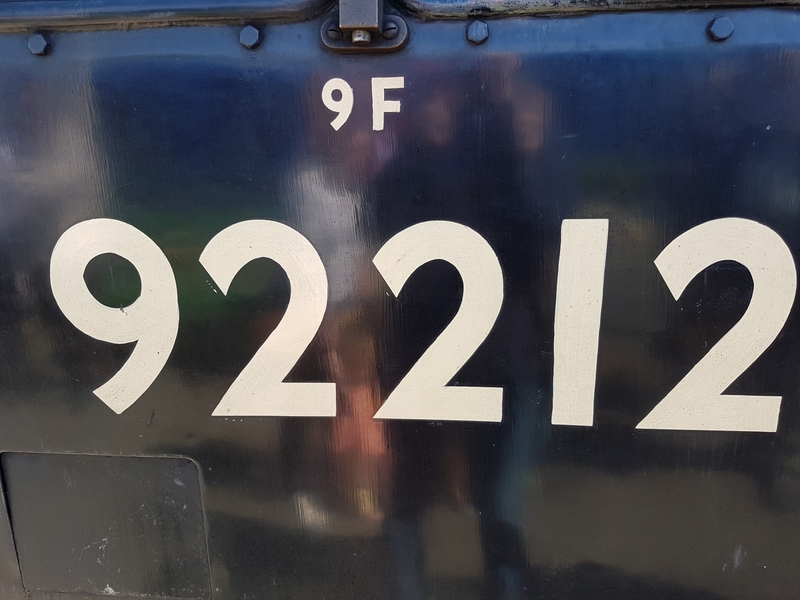 92212 is obviously well cared for, with a lovely oily sheen on the black paintwork. 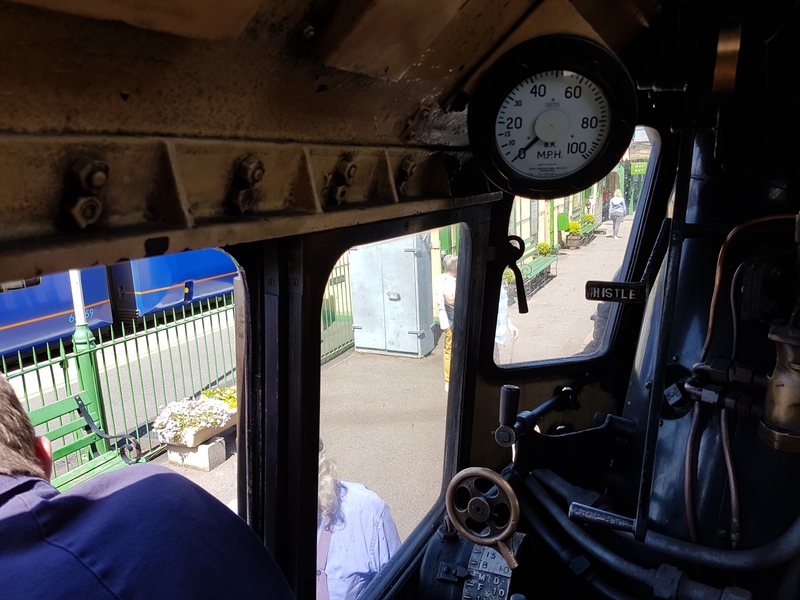 Though I wasn’t getting a footplate ride (strictly one person, one way), I was delighted to be invited up to have a look inside the 9F’s cab. There’s a lot of room up there, and a decent roof, compared with older locomotives. But it’s not much more comfortable. 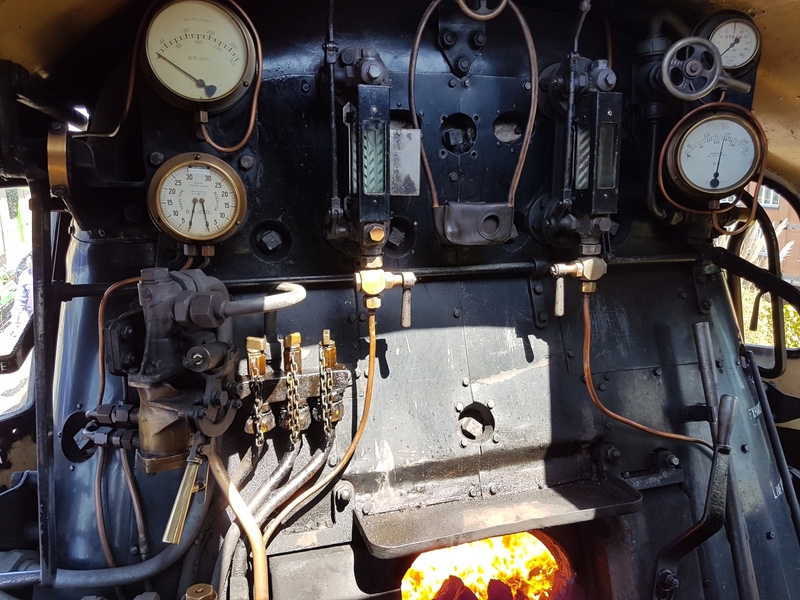 I think the last time that I was on the footplate of a steam locomotive was 1972 at Barry scrapyard – though my EMU cab ride in Hong Kong is another story. 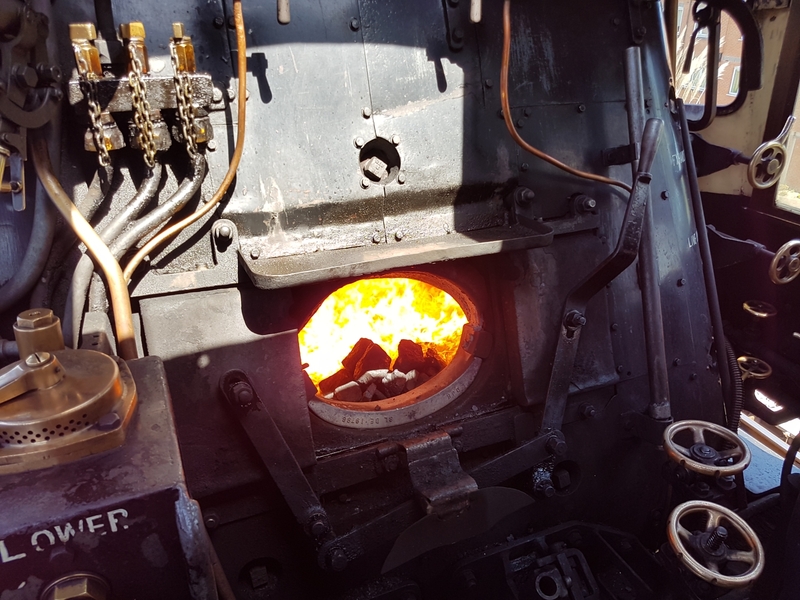 And so back to Arlesford – ready for Phil’s big moment on the footplate. More next time. 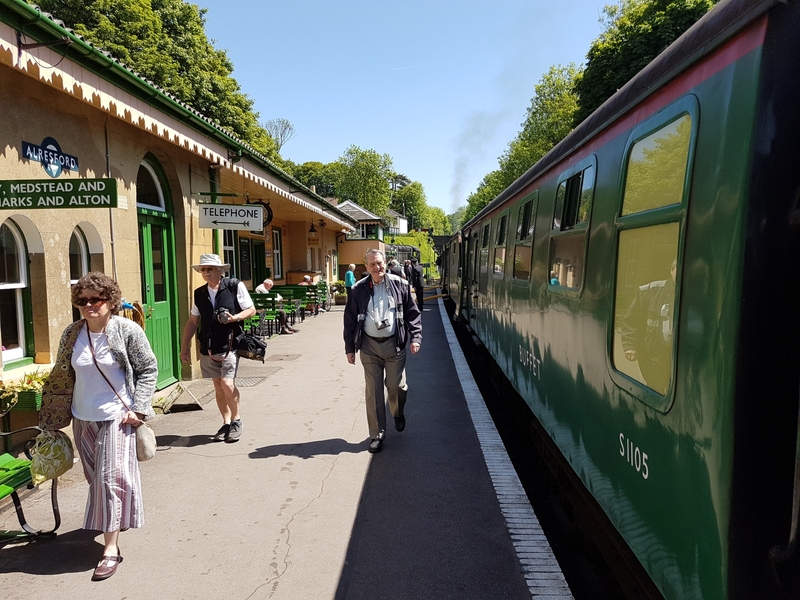 This entry was posted in ESNG, Inspiration, Out and about, Prototype and tagged ESNG, prototype, railway, Southern Railway. Bookmark the permalink.